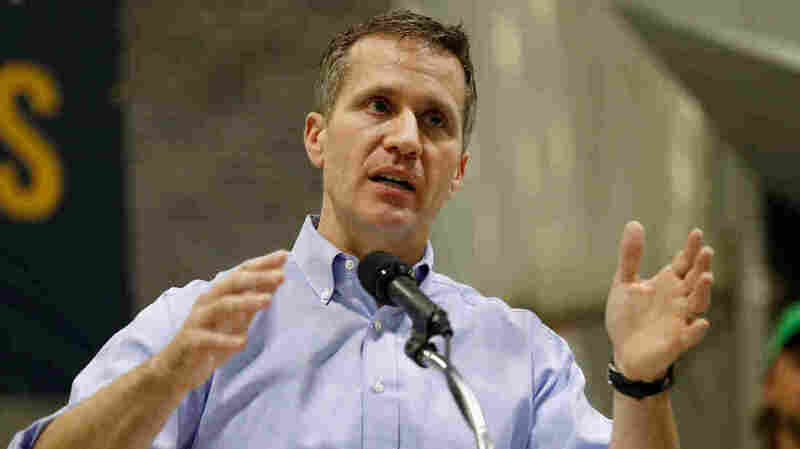 Missouri Governor Accused Of New Felony, After Allegations Of Assault And Blackmail : The Two-Way Eric Greitens was already under pressure to step down over allegations of sexual assault and privacy violation. Now Missouri's attorney general wants him to be charged over his campaign practices. Missouri Gov. Eric Greitens speaks in Palmyra, Mo., in January. Missouri Gov. Eric Greitens, already facing one felony charge for invasion of privacy, as well as allegations of sexual assault and blackmail, could potentially be charged with a separate felony for his campaign practices when he ran for office. Greitens calls the suggestion of a new charge "ridiculous." He vigorously denies all allegations of criminal activity — consistently saying his only wrongdoing was a consensual affair — and has refused to resign, despite calls from state lawmakers. The possibility of a new felony charge was raised by Missouri Attorney General Josh Hawley in a press conference on Tuesday. He alleges that Greitens took a list of donors to his military veterans charity, transferred it to his political campaign, and used it for political fundraising. The accusation that the list was used for political fundraising was first lodged against Greitens in 2016, before his campaign victory. What's new is that Hawley says there's enough evidence to charge Greitens with a felony. Hawley cannot bring the charge himself, but asked St. Louis Circuit Attorney Kim Gardner to prosecute. Gardner is already prosecuting Greitens over the violation of privacy charge, which stems from a sordid scandal. In January, TV station KMOV in St. Louis ran an explosive story about an affair Greitens had with a hairdresser; he later confirmed the affair, but he denied the rest of the report. The TV station had audio recordings of the woman, which were acquired through her ex-husband. In them, she describes Greitens apparently taking a photo while she was blindfolded, bound and naked, then telling her to "never mention my name" or the photo would be released. Gardner's office says that taking the photograph as described, without consent, would violate state law. That criminal case has had a rocky road, with prosecutors admitting they made an "egregious mistake" in hiring a private investigator who made errors. A judge will decide on Thursday if the case moves forward. Meanwhile, Greitens faces the possibility of impeachment over the same scandal. A detailed report from the Missouri House accuses him not only of blackmail, but of sexual assault and other physical violence. "The governor says the report is full of lies and falsehoods and predicts he'll be exonerated once the invasion of privacy case goes to trial. But he's been hemorrhaging support from fellow Republicans across the state ever since the scandal broke." The suggestion of a new felony charge — astounding as it may seem — is from an entirely different scandal. Greitens, a former Navy SEAL, founded a nonprofit called The Mission Continues which supports military veterans. He's accused of improperly using the charity's donor rolls to bolster his political campaign. In October 2016, near the end of Missouri's gubernatorial race, The Associated Press reviewed financial records and found significant overlap between donors to The Mission Continues and the Greitens campaign. The AP also obtained an Excel spreadsheet listing major donors to The Mission Continues, writing: "Its properties show it was created by a Mission Continues employee May 6, 2014, shortly before Greitens stepped down as CEO, and was last saved March 24, 2015, by Michael Hafner, who had been working for Greitens' gubernatorial exploratory committee." "Hawley announced on Tuesday that his office had evidence that Greitens illegally obtained that fundraising list. The Mission Continues has adamantly denied giving the donor list to the Greitens campaign. "If proven, Hawley said these acts could amount to unauthorized use and taking of property, 'in this case electronic property.' And given the value of the list in question, Hawley said, the offense amounts to a felony." The St. Louis Circuit Attorney's Office confirmed to St. Louis Public Radio it is reviewing evidence in connection to the allegation, but cannot discuss specifics. Greitens, again, denies all criminal allegations. "Fortunately for Josh, he's better at press conferences than the law," the governor said in a statement, according to St. Louis Public Radio. "Anyone who has set foot in a Missouri courtroom knows these allegations are ridiculous,"
Greitens called Gardner a "liberal prosecutor" and Hawley's claims of a possible felony "false allegations." On Twitter, Greitens reiterated that he will not resign.